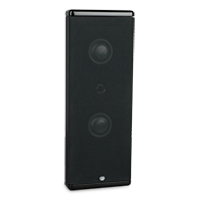 This versatile on-wall speaker is the answer to many installation conundrums. It’s sleek, contemporary design with a magnetic mounted black fabric grille complements most any décor. At only 1-5/8-inches thick, 18-inches tall and just over 6½-inches wide, it fits almost anywhere you can pull a wire through a wall. The pull-through ez-wire terminal cup makes connection a breeze.